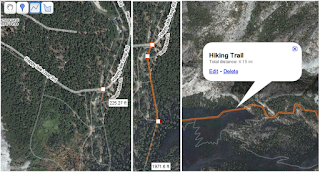 As many of you have discovered, the line tool in Google Maps is a great way to create maps of your bike routes and hiking trails. 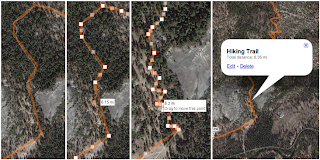 But something has been missing: After plotting out a hike in Yosemite, how do you know whether it's going to be a 2-hour hike or a 2-day hike? You can't tell how long the trail is! Well, now you can. We've added distance measurement to the line tool. Whenever you draw a line, you'll see the current distance as you move the mouse and add new points. The distance is also displayed in the info window when you click on your completed line. Here's one of my favorite trails. I cut through several switchbacks as I was drawing the path, so the distance wasn't very accurate initially. Luckily, it's easy to refine a path by dragging on the "ghost points" (those translucent squares that appear at the midpoint of each line segment) to add detail in the middle of a completed line. As I did so, I watched the distance increase. And there it is: a lovely hiking trail in all its wiggly glory. At 12.7 miles round trip, there's no need to pack a tent, but I hope someone remembers the trail mix.